That number 51 is different when you know it's not Anthony Simmons, isn't it? Except Anthony Simmons isn't playing for anybody right now and has a bad wrist. 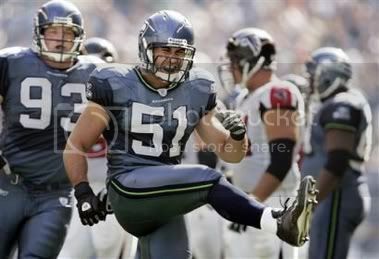 Yes, the man above is Lofa Tatupu. If he keeps going like he has in the first two games, he won't be a reach like he was labeled on draft day. Here it is, the piece for Week 2. The stuff right under the headings is off the top of my head, and the other stuff is as labeled. The link to the Gamebook is here. --Ken Hamlin "horse-collared" Vick to end the first quarter, according to Steve Raible, and I did see the play later on a highlight reel...what was the kind of tackle that was made illegal in the offseason? They needed this win. Sure, it wasn't the biggest must-win in recent memory. It wasn't any of the three games against the Rams last year. However, the alternative was worse. A loss and an 0-2 record would have made me incredibly glad I'm not in Seattle within KJR airwaves. It would have been an all-out crisis line with endless cries of "same old Seahawks." Not that they didn't try to be the same old Seahawks in the second half. Like Jeremy alluded to in his post, it'll be inevitable for all Seahawk fans to have the Week 5 game from last year in the backs of their minds whenever they have a fourth-quarter lead. Hell, I had it in my head when they went into halftime with the 21-point lead. The bottom line is that if the Seahawks get any sort of lead, I'm already focused on the worst-case scenario. Why? This is a trained behavior. This is being a fan of Seattle sports. This is nothing new. From a team perspective, this game is a lot easier to stomach with the Seahawks winning. They bended but didn't break. It would have been unbearable for me going through the next week with this team 0-2. Instead, the Seahawks with a 1-1 record are in a three-way tie for first place. Next week, they face the trendy pick to win the NFC West, the Arizona Cardinals. After getting drubbed in Week 1 by the Giants, the Cardinals never reached the end zone at home against the Rams. Also from a team perspective, it was an emotional win given the condition of Ray Rhodes, who was in the stadium for the game, though not carrying on with normal duties. To sum it up, the Seahawks had a very good first half, and damn near took the second half off. If they get up 21-0 on any team, they should stomp on that team and put the victory out of doubt. When that happens, we'll truly know that this team has made some kind of leap, and maybe even the leap. Next week at the Q, it's the 0-2 Arizona Cardinals, picked by a bunch of media types to win the NFC West. Neil Rackers was the all-star for the Cardinals yesterday, kicking four field goals. Kurt Warner was able to throw for 327 yards and the Cardinals never reached the end zone. They were 4-for-13 on third down. They managed only 82 ground yards. Eight penalties for 72 yards didn't help either. Keep in mind that the Cardinals were at home yesterday. Also, the Cardinals' new uniforms are terrible. See you next Sunday. Of course, if you want to wade through Mariner stuff, we've got that throughout the week. Also, the Canucks start preseason play on Wednesday.